Expertise in biostratigraphy, micropaleontology and petrography for industry or research projects. The services proposed are transformation of samples, different types of analyses and expertise, such as Lower Paleozoic palynology, Mesozoic foraminiferas for age and depositional environment interpretations and correlations. Biostrat Solutions is a young company set up by Chloé Amberg after a master degree in geology and paleontology, a few experiences in the oil industry and a PhD in geosciences, ecology, paleontology and oceanography. With a field of expertise comprising Lower Paleozoic palynology (chitinozoans), Mesozoic foraminiferas and carbonaceous microfacies, Biostrat Solutions proposes physical transformation of samples, different types of analyses, extended or not, and expertise to interpret ages, paleoenvironments and make correlations. 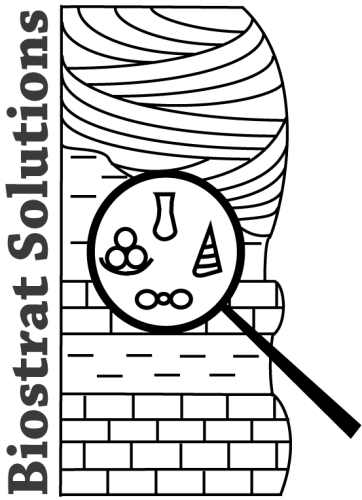 In addition, the supports of experts and colleagues allow Biostrat Solutions to expand its field of intervention to other fossil groups and era, such as Tertiary foraminiferas, spores and pollen, dinoflagellates, calcareous algae, ammonites or ostracodes.